There’s a cute-as-a-button kid named Declan Tramley who likes to ride his little big wheel type deal all over the piers in Halifax, Nova Scotia. His folks take him out all the time, and the kid has become something of a celebrity in the area, especially with the motorcycle riders the young boy idolizes. But rules are rules, son! 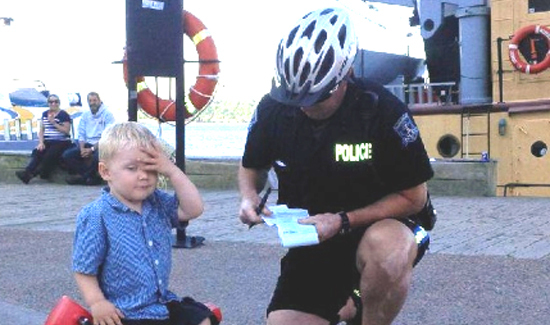 Constable Shawn Currie saw Declan leaving his “bike” in a “no-parking zone” recently and decided to write the kid up. Currie says it’s a good idea for cops to generate positive PR whenever and wherever they get a chance to do so.